Do you have concerns about the harmful effects of unhealthy holiday meals? Are you scrambling to think up a new Christmas menu for your senior loved one? 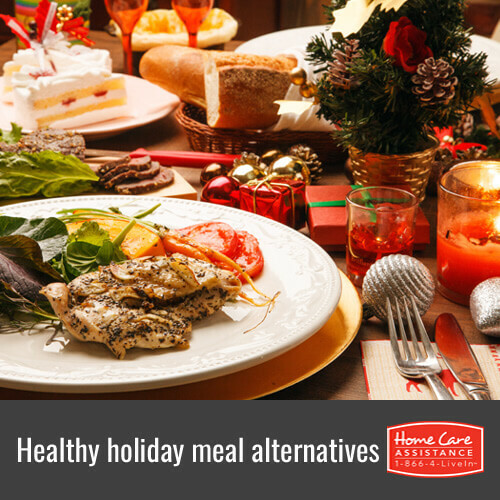 The Grand Strand hourly care providers have put together this list to show you how to deck the dinner table with delicious but healthy mains and sides for your senior loved one this Christmas. Duck has a rich and unique flavor that makes it a favorite on the Christmas table for many families. Still, it’s uncommon enough that we felt we had to mention it. The common method of preparing this tasty bird is to roast it and add chestnuts for extra holiday flair. Chicken is delicious 365 days a year, which is precisely why it can seem a little boring for Christmas dinner. If that’s the case, try making a more festive dinner by accenting it with a holiday favorite like plums. You can use whole plums for a sweet and savory dish or use the fruit to make a rich sauce. When most of us think of quail, we probably think of all the hours we spent as children learning the letter ‘q’. However, these appetizing birds are perfect for the Christmas table. They work well in chicken recipes while offering a unique twist that’ll make Christmas special. Mashed potatoes are a common sight on many holiday dinner tables. However, if you are concerned about gifting your senior with too many carbs, mashed rutabagas are an excellent replacement. Simply boil and mash them like you would potatoes, but add a little less butter to preserve the nutritional value of the dish. This dish works well as a side to whatever poultry main courses you choose, but it also works as a satisfying dessert. Great tasting and easy to chew, pears are also high in fiber making them a wonderful addition to a senior holiday menu. Poach any variety of pears and season with cinnamon and vanilla for a wholesome treat. For an additional Christmas treat for your senior loved one, reach out to Home Care Assistance of The Grand Strand. As a trusted provider of in-home care in The Grand Strand, our experienced caregivers deliver optimal home care to local seniors whether they need transportation to and from medical appointments or simply need help preparing nutritious meals throughout the year. Call a knowledgeable Care Manager today at (843) 353-3105 to learn more about how we can help your elderly loved one.